Thankfully, the weather was considerably better than last year so there were very few cancellations. The Under 11s played some super cricket at times and there is plenty of potential as they move into Senior School. 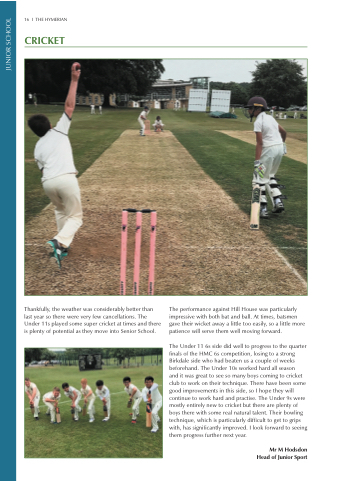 The performance against Hill House was particularly impressive with both bat and ball. At times, batsmen gave their wicket away a little too easily, so a little more patience will serve them well moving forward. and it was great to see so many boys coming to cricket club to work on their technique. There have been some good improvements in this side, so I hope they will continue to work hard and practise. The Under 9s were mostly entirely new to cricket but there are plenty of boys there with some real natural talent. Their bowling technique, which is particularly difficult to get to grips with, has significantly improved. I look forward to seeing them progress further next year.